Creepy, crawly and usually diseased all over; we respect your drive to attempt DIY pest control, but there are five specific reasons why you should reconsider. There are the pests that everyone knows– mice, silverfish, fruit flies– but there are also some that can be a little more difficult to identify (we’re looking at you, water bugs). Sure, you can do your research and try to guess correctly, but the reality is, the best way to know for certain that you’re properly treating for pests, is to have a professional identify your problem in the first place. Like we learned during last week’s Super Bowl, the best defense is a good offense. And here at Command Pest Control, you can consider us your Defensive Tackle! With pest control specialists like ourselves, we approach each and every job uniquely. We thoroughly evaluate each customer’s needs and apply a customized solution to meet those. Not only do we offer pre and post-construction regular treatments, but we also spray and continually monitor your entire property’s perimeter to keep bugs at bay. As an experiment, take a stroll down your local hardware store’s pest control aisle. The rows upon rows of shiny cans and fancy sprayers may be impressive, but stay with us here– this is an experiment! Now turn those cans around to their back and take a look at the warnings on them. Yikes! Most homeowners have not been trained on how or where to use pesticides. Pest control specialists, on the other hand, not only have the expertise on where to spray these chemicals, but they know how to do it in a way that’s safe for your family– and not safe for the pests they’re targeting. Between a mortgage, dance classes, energy bills and groceries; the idea of adding one more bill to your constantly-growing stack may seem like too much to bear. The reality is though, paying a few hundred dollars a year to have your home treated for pests could easily save you the thousands of dollars that it would cost if termites or carpenter ants were to choose to chomp on your home. So if you find yourself questioning whether or not you can afford professional pest control treatments, ask yourself this– can you really afford not to? It can be difficult to determine which household chores can be done yourself and which require pros, but when it comes to pest control, we strongly urge you to contact us. 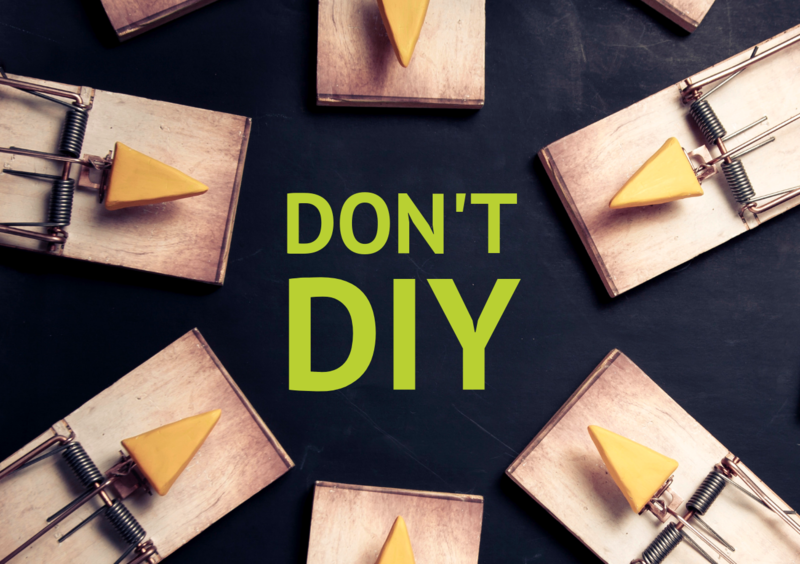 Sure, DIY projects can be fun, but when it comes to the safety of your home, there’s no room for error. Contact Command Pest Control today for your free estimate.